Choosing a non toxic play mat made of natural, certified safer materials is a great way to help reduce chemical exposure on your baby. Why Choose A Non Toxic Baby Mat? If you’ve already got a little one you’ll know how much they love to roll around on the floor exploring, chewing and tugging on everything in sight! It’s a natural and essential part of any baby’s development. But many toddler and baby play mats (and changing pads) contain polyurethane or EVA foam or PVC, materials linked with health issues. And whilst chemical toxins aren’t healthy for any of us, babies have immune systems, which are still developing, making it harder for them to fend of these toxins. 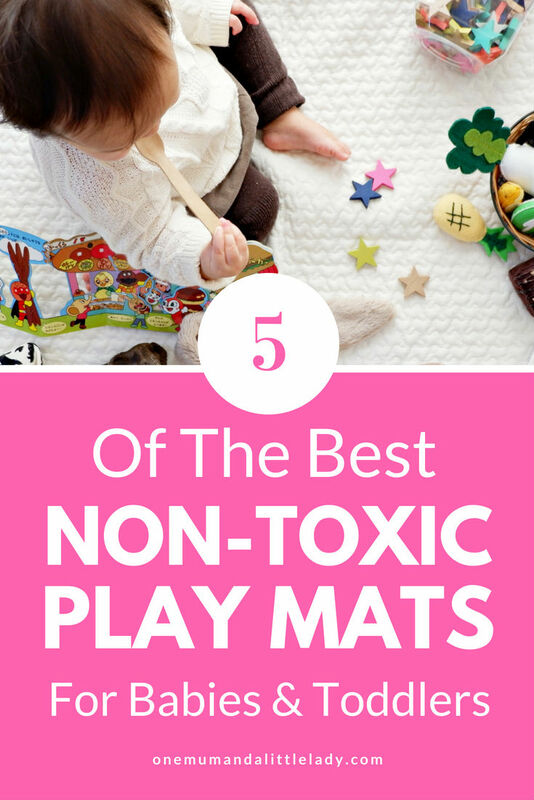 So it makes sense to shop for play mats that are free from these chemicals, wherever possible. As a guide, when shopping for a play mat, look out for mats that are flame retardant, PVC, polyurethane and EVA foam free. PVC often contains phthalates and the main problem with polyurethane foam is that it often contains flame retardants, which are linked to a number of health concerns. And EVA foam, although generally considered a safer alternative, has been found to off gas formamide, a suspected carcinogen. Whilst some experts argue that even if formamide is emitted, it’s in such small doses, it likely won’t do any harm, strict limits have been imposed on it in EU countries such as the UK, France and Belgium. So if you do opt for foam, I personally think it’s best to look for formamide free play mats and mats that state they’re free of flame retardants. The Kutchu Children’s Play Mat is made from 100% natural rubber and is a bit like a huge baby yoga mat! Designed for use on hard surfaces, it’s naturally non-slip. It’s got a soft rubber surface, with cushioning to protect baby. It’s also reversible, with a fresh green colour on one side and violet on the other. It’s likely to have a natural rubber scent initially, but this which will fade over time and you can also air it to speed up to the process if you’re not keen on rubber odours. It’s also really easy to clean with a damp cloth, as well as easy to roll up and store if needed. Dimensions: Large play surface: 130 x 168 cm (approx. 4.25 x 5.5 ft), and 5 mm thick (3/16 in). Made from: Made from natural rubber. Free from from phthalates, foaming agents and chemical flame retardants. I love the Pillobebe play mats. They’re super cute and handmade with soft, natural 100% Certified Organic Cotton fabric. The facing and backing are made from cotton and the cover is removable for easy washing. There’s a lovely range of cotton covers to choose from, in both visually stimulating or plainer options, depending on your preference. Covers also include a non slip feature and an invisible zipper on the bottom. The padding is made from 100% polyester fibres, which are free of flame retardants. If you’re looking for a play mat for a hardwood floor, it’s recommended you opt for a double padding option or Pillobebe’s higher density Corkimat. Dimensions: Appx. 55″ X 55″ for the cover, appx. 52″X52″ for the insert. Made From: 100% Certified Organic Cotton fabric, with polyester fibre padding. Free of formamide, fire-retardants, PU, PVC, BPA, BPS, formaldehyde, phthalates, lead & VOCs. Made from food grade materials (XPE foam), the Myline play mat is waterproof and easy to clean. It’s got no stinky smell (like some play mats!) and is one of the more affordable mats out there. It’s also a good option for hardwoood floors. 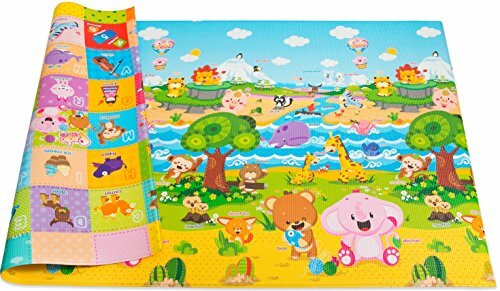 If you’re after a play mat that is visually stumilating, this could be it, as the mat features a fun array of vibrant colors, characters, letters and numbers, which can aid baby’s visual and motor development. Dimensions: 78.7 x 0.6 x 70.9 inches. Made from: Food grade XPA foam. BPA, phthalate, latex and lead free. Although this mat is certainly free of many common toxins, ‘food-grade XPE’ is rather a vague description and I can’t seem to find any concrete information about what this actually means. You may want to take this into consideration depending on your own personal buying criteria. 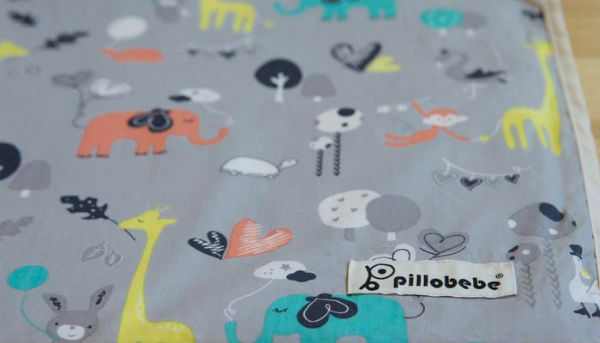 The Baby Bello is an organic play mat made in the USA. The machine washable cotton cover is a plain design to keep it 100% organic and the spacious nature of the mat works well on any surface. The mat can also be rolled up for easy storage and there’s a protective waterproof layer underneath the cotton cover. This is a great choice if you want a mat that blends in more to your decor. It’s one of the pricier options, but gets consistently great reviews from parents for it’s comfort, cushioning and ease of use. It is made of polyurethane foam (1/3 from soy oil), but as the mat isn’t designed for sleep, it’s not been treated with flame retardants. Dimensions: 55 x 55 x 1.5 inches. Made from: Core of the play mat is made of plant based polyurethane foam that is not treated with flame retardants. Non-toxic waterproof layer is made of vinyl/PVC free non-toxic medical grade stretch knit fabric with safe sewn seams for anti-bacterial and dust-mite protection. VOC (off gas) and heavy metal content tested. 100% Natural Organic Cotton Cover. Phthalate and BPA free. I should start by saying that this mat is made from PVC foam, but I’ve included it because the manufacturer states it is phthalate-free. 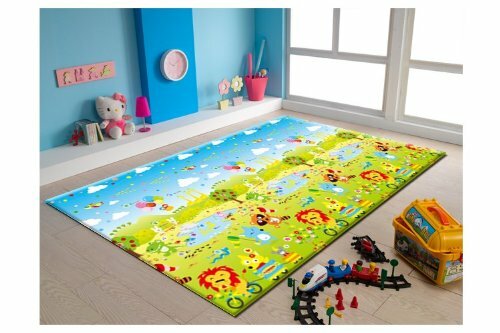 It’s also one of the most popular baby and toddler play mats out there, with consistently strong reviews from parents for it’s design, durability and ease of use. However, if you want to avoid plastic, or have concerns about other possible toxins leaching in PVC, you may want to opt for a different mat. The play mat itself though is reversible, with fun and stimulating designs. It’s waterproof, easy to clean and simple to roll up and store. The mat also has the advantage of being larger than many other conventional play mats (there’s also a medium version if you want a smaller option). Made From: PVC foam. Phthalate Free, BPA Free, Lead Free, Latex Free, Formaldehyde Free, EVA Free. If like me, you live in the UK, it can be pretty frustrating as I’ve found the play mats featured above aren’t all readily available here. This surprised me to be honest, as EU safety laws for kids’ products tend to be more stringent here. One option is to get a mat shipped from the US (if available), but this obviously bumps the price up. The Baby Care mat is on Amazon UK, but when I last looked it was over double the cost of the exact same mat on Amazon US! They may sometimes be available on Ebay, so it’s worth looking there. Another option is the Dwingular Eco Friendly Play Mat. Although it’s PVC, it’s marketed as non-toxic and their lab safety reports are available here. It gets largely very good reviews from parents, although it is on the pricey side. If you have a baby or toddler, play mats can prove a really practical addition to your home. Not only do they aid with visual and motor development, they also offer a safer space for babies to explore their surroundings. Floors and carpets can be a bit of a haven for dust and bacteria, so a play mat can help ensure a healthier environment for baby to roll, crawl and play. 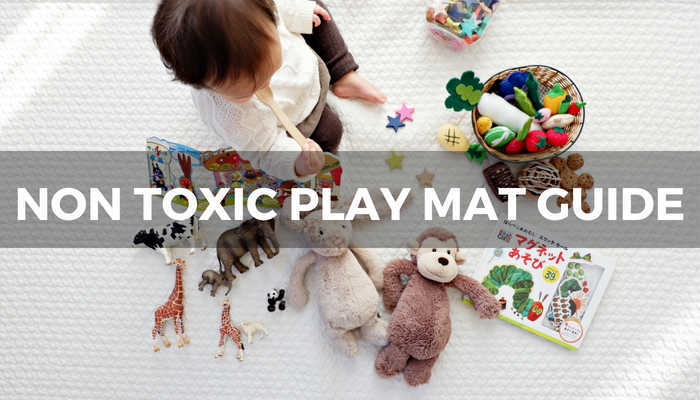 It’s impossible to avoid toxins completely, of course, but choosing a non toxic play mat helps ensure your baby has a safer and healthier place to explore without you having to worry about toxins that may be present in many conventional PVC and EVA foam play mats. Hi, Sarah. I’m a fan of play mats at home so that babies and kids can roam around safely at home. I have some with pictures of cities and road tracks for kids to play with their cars and little peoples. It’s a load of fun for them. I used to have one favorite with this city and road track patterns and it was stated non toxic. However, we had some water spilled and water seeped in. It dried but became powdery on the base and emitted smell like chemical that I had to throw it away. I don’t even know if it is true that it is non toxic play mat as it says but the smell put me off and I had to throw it away despite the fact the kids love it. How can we be sure if it is non toxic? Hi Mjia, If you follow the tips on this post it will really help – the main things to look for in my experience are mats that are flame retardant, PVC, polyurethane and EVA foam free. If you’re ever unsure, you can always contact the manufacturer or ask for their lab reports. At the end of the day, It’s pretty much impossible to say something is 100% ‘non toxic’, but for me it’s more about finding the safest products we can for our kids, with the information currently available. Hope that helps. Great guide, but your last one is not safe at all. PVC, even phthalate free, still contains chlorine which emits dioxin. PVC is never safe. I suggest you remove it. Hi there, many thanks for your comments. I’m not personally a fan of PVC either and am v conscious of the dioxin debate, but as I understand it dioxin can only be released from PVC when it is burned at low or extremely high temperatures. I also suggest that if you’re not comfortable with PVC, it’s better to choose one of the other mats.